This delicious post is brought to you by Gorton's new Go Saucy! line of frozen offerings. All opinions are my own. These are fish tenders for grown ups. Make a complete meal with a cheesy polenta cake with a generous helping of black bean mango salsa. You will be amazed at how simply this delicious meal comes together. Three components to this mea but two of them can be prepped ahead and one of them comes from the freezer section thanks to Gorton’s Go Saucy! Sweet Chili Tenders. This cheesy polenta cake can be customized to your taste by changing up the cheese or adding herbs. This is a basic recipe to get you started. Bring the chicken stock and milk to a boil. Turn down the heat to medium/medium low and cook 8 minutes. Stir every few minutes to prevent scorching. Remove from heat and add the cheese and butter. Stir until incorporated and melted. In a small, deep, greased pan, spread the polenta evenly in the pan. Pro tip: Use a spatula or scraper dipped in water to smooth the polenta. Cool completely in the refrigerator. This is one part that can be prepped ahead. When it is time to serve, turn out the polenta cake and cut into portions. I am using a round cookie cutter but you can cut the polenta cake into squares or triangles with a knife. Gorton’s has debuted a line of Go Saucy! frozen entrees. This recipe is featuring the wild-caught pollock fish tenders with the sweet chili sauce packets included in the box. They are delicious on their own and you have the option to dip, toss or glaze your fish tenders with the sauce. Follow package directions and bake the fish tenders. While the fish tenders are baking, sear the polenta cake in a touch of oil. Flip after about 3 minutes and sear again. This will give the polenta cake a lovely crust and heat it through. If you love this recipe you need to try my recipe for Buffalo Shrimp Flatbread with Blue Cheese Crumbles. Serve the crispy fish tenders with the sweet chili sauce and a generous scoop of black bean mango salsa. 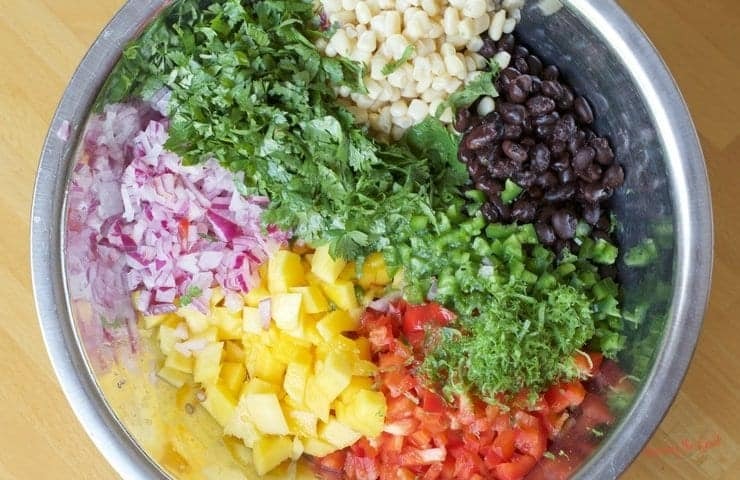 Combine all the black bean mango salsa ingredients in a bowl. Adjust the seasoning with salt to your liking. Add the optional avocado if you like it. 1/4 bunch cilantro, more if you like it!